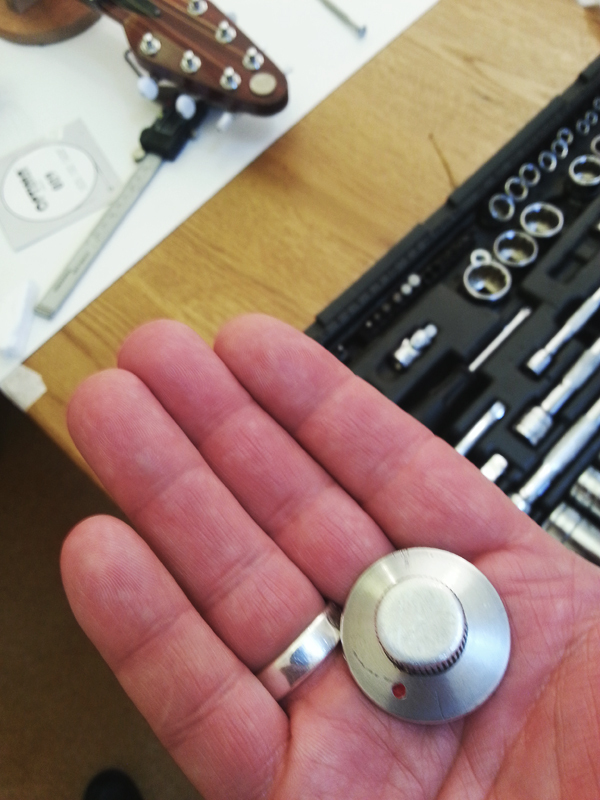 Here’s the second exclusive shot of various parts of the Red Special, taken during the dismantling of the guitar for the book ‘Brian May’s Red Special’. 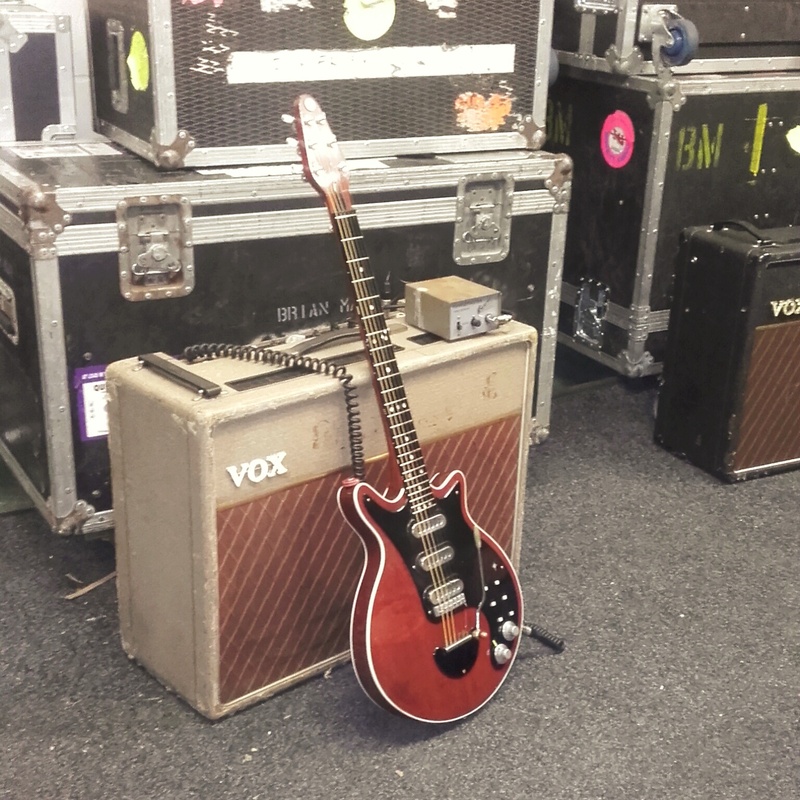 As a treat to help lift the dark clouds of Blue Monday, here’s the Red Special in a state of undress. It’s an outtake from the photo session that provided incredible images that formed the heart of the ‘Brian May’s Red Special’ book. 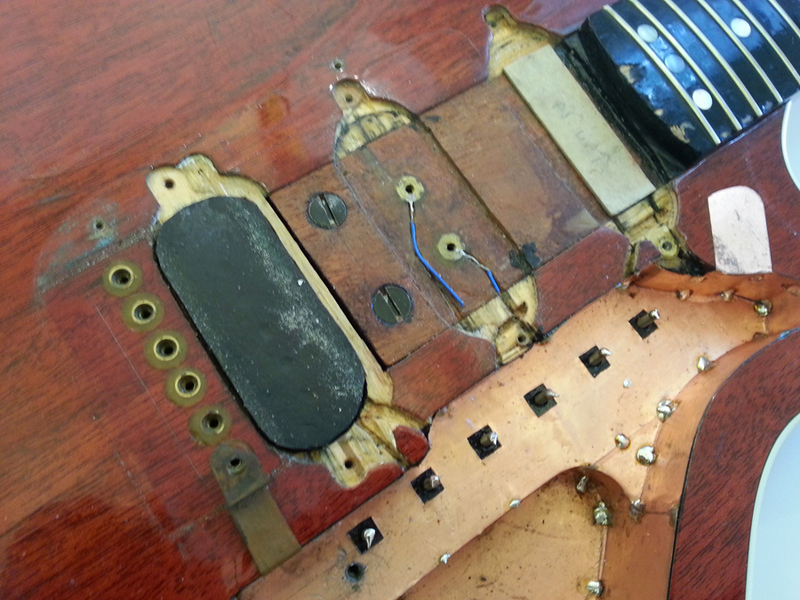 The screws that secure the mahogany neck to the guitar’s oak insert are clearly visible, as are the contacts of the middle pickup, one of three that Brian made and wound before discovering that Burns Tri-Sonics did a far better job. We can also see that, in the guitar’s dim and distant past, the bridge pickup has been moved back towards the bridge a couple of mm and a rubber base has also been included. 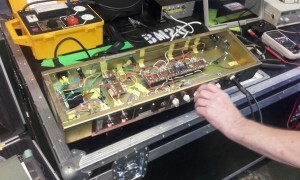 Greg Fryer applied the copper shielding to the control cavity, and we can also see how thin the mahogany veneer is atop the lighter-coloured blockboard. This photo, snapped by co-author Simon Bradley, was obviously taken before Andrew Guyton‘s more recent restoration and we’ll be posting a few more shots like this over the coming weeks and months, so keep checking back to www.theredspecial.com. The August 2016 issue of UK publication Guitar & Bass features a detailed piece on Brian’s Vox AC30 amps, written by the co-author of the Red Special book Simon Bradley. Here, for your viewing pleasure, are a selection of phone shots taken on the day by Simon that show just a little more than could be squeezed into the feature. 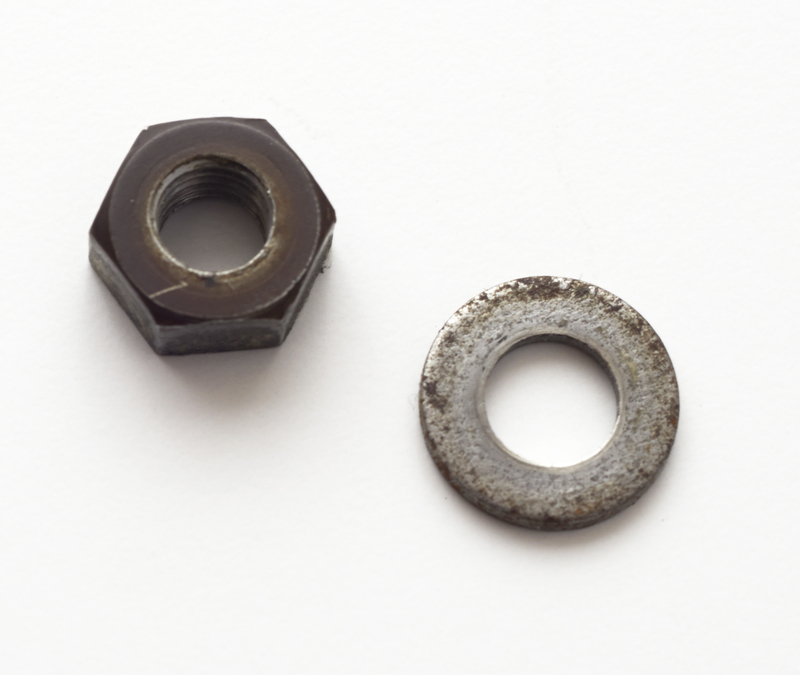 Rest assured that the images that feature in the magazine itself, courtesy of Eleanor Jane, are of an infinitely higher, nay professional, standard but we hope you enjoy this exclusive peek. 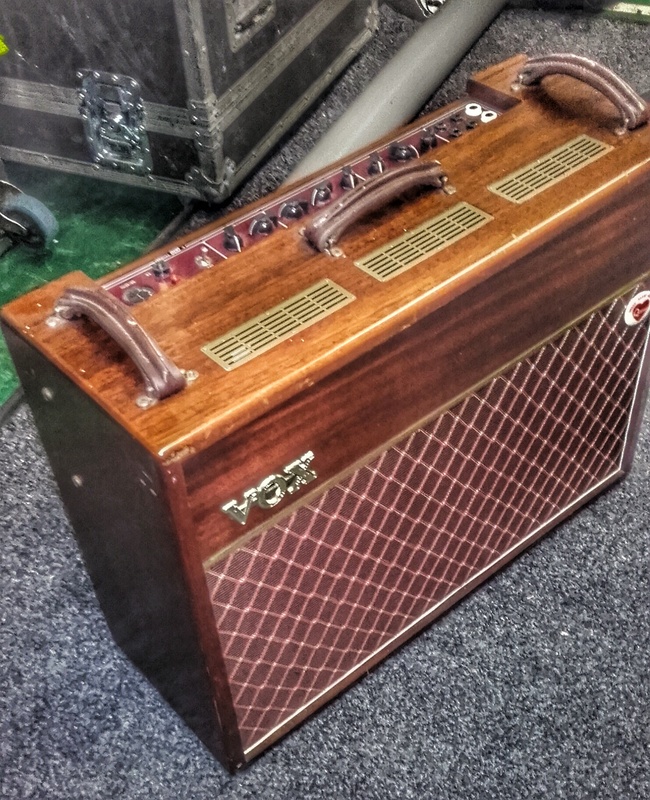 The August 2016 issue of UK publication Guitar & Bass features a detailed piece on Brian’s Vox AC30 amps, written by the co-author of the Red Special book Simon Bradley. 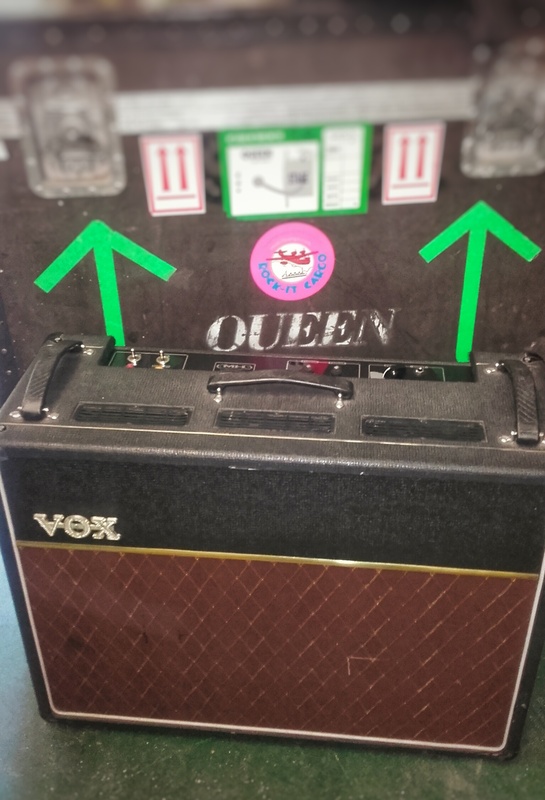 The cover feature looks at many amps from Brian’s personal collection of AC30s and obtains unrestricted access to the amps being prepped for 2016’s Queen + Adam Lambert tour. 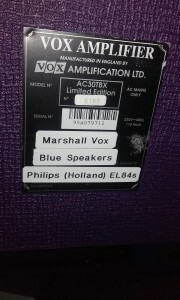 There’s also detailed information concerning a brand new AC30 that forms the heart of the rig. 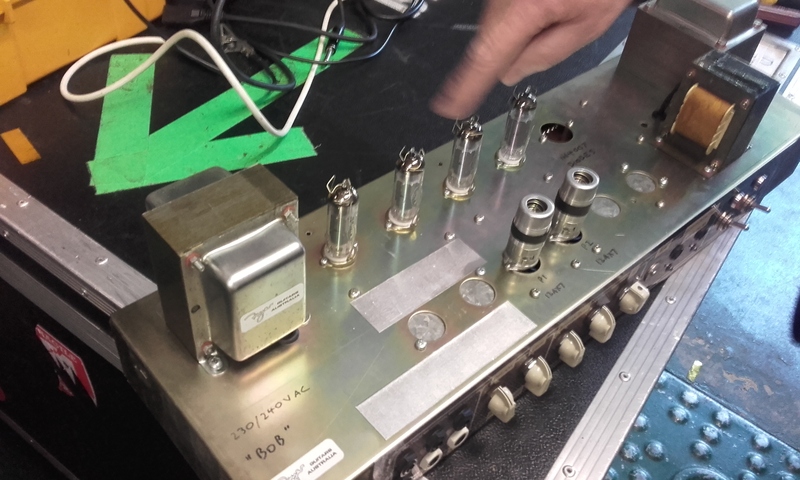 Illustrated with high-quality photography throughout, with several shots of amps never seen before, the piece also includes in-depth interviews with engineer Mike Hill, who regularly services Brian’s gear, and guitar tech extraordinaire Pete Malandrone. 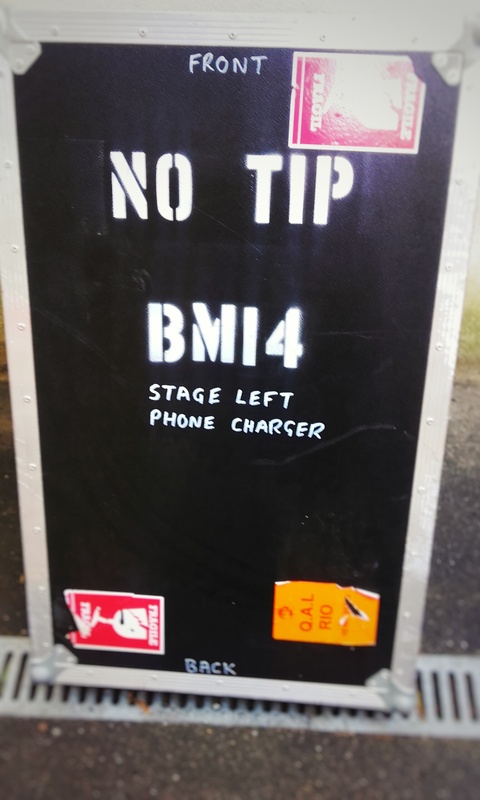 It’s a fascinating and unique insight into Brian’s touring life and shouldn’t be missed. The magazine is on sale now, priced £4.99 on UK newsstands. 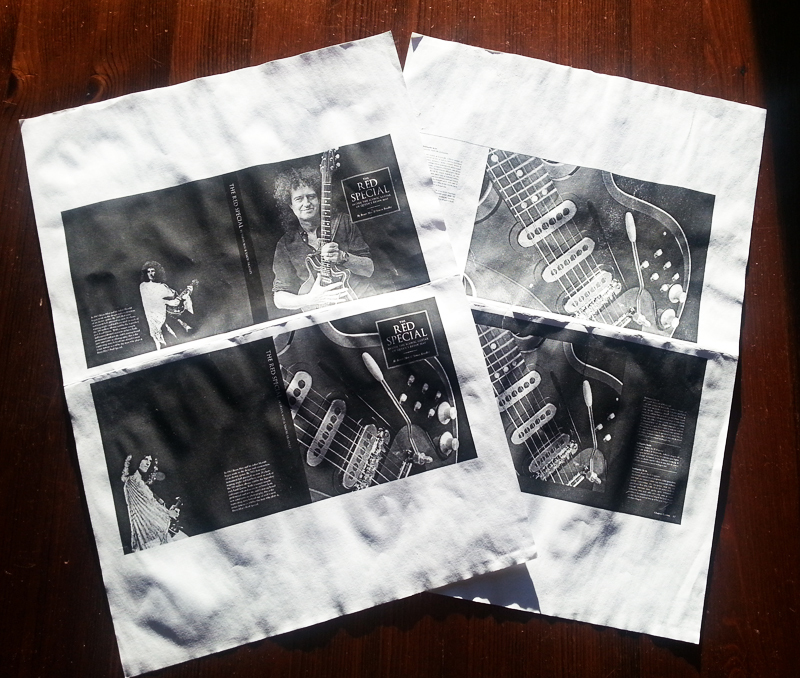 Find out how to order a single print or digital copy of the magazine by clicking here. More information on the magazine can be found at www.guitar-bass.net. 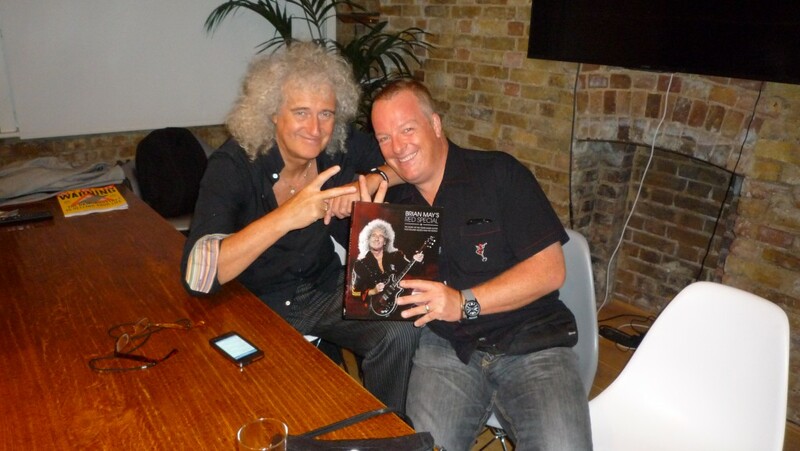 Brian May took time out before the ‘One Voice’ show with Kerry Ellis in Milan to meet up with members of Tsunami Edizioni, publishers of the Italian version of the Red Special book written by Brian and Simon Bradley. Copies are available at each of the venues and are selling very strongly, which is great news. 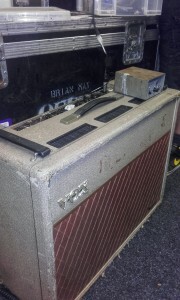 You can read about the tour so far in Brian’s own words by clicking here, and it sounds like some great music, plus no small amount of fun, is happening out there! 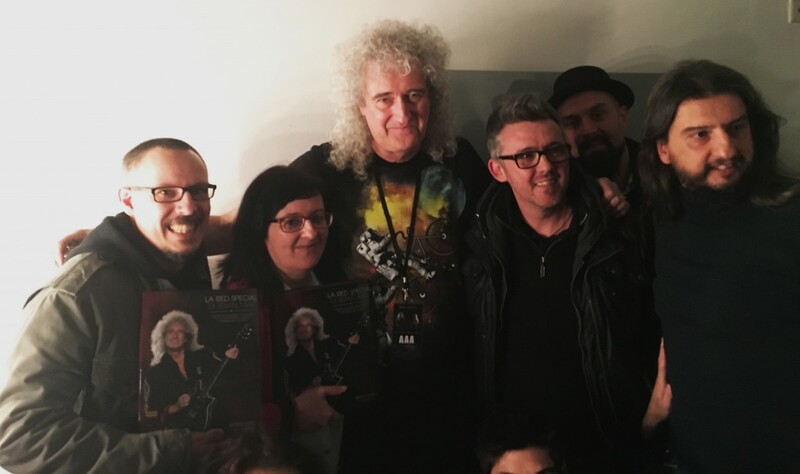 The team backstage at the Arcimboldi Theatre, Milan, 25th February 2016. (l-r) Max Baroni (Tsunami co-founder), Raffaella Rolla (official translator), BM, Angelo Malatesta (guitar tech consultant), Alex Pietrogiacomi (in hat, Tsunami press office) and Eugenio Monti (Tsunami co-founder). 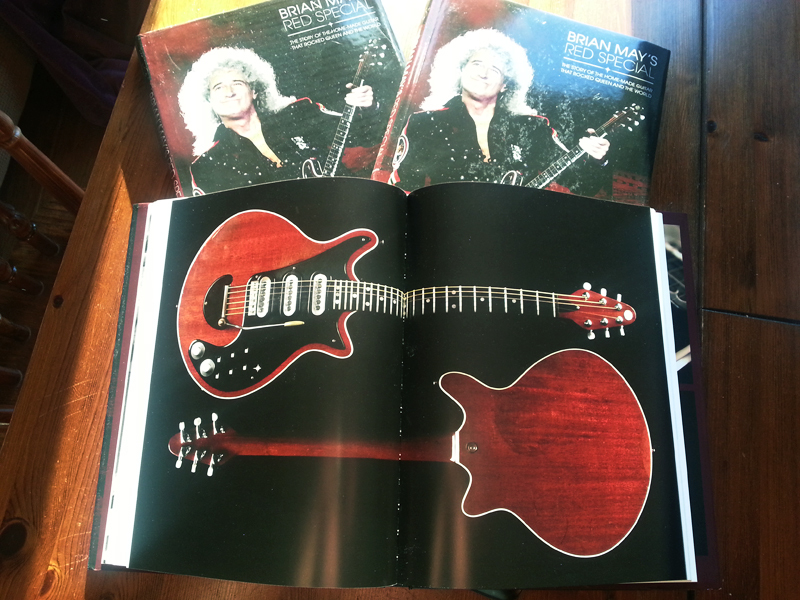 Italian Queen fansite Communità Queeniana has conducted an interview with the co-author of the Red Special book, in which he talks about aspects of the book’s production and how Brian was involved, as well as his own background and history. Pre-order your copy now on www.tsunamiedizioni.com to get a special discount and a unique chance to win the very first copy signed by Dr May. 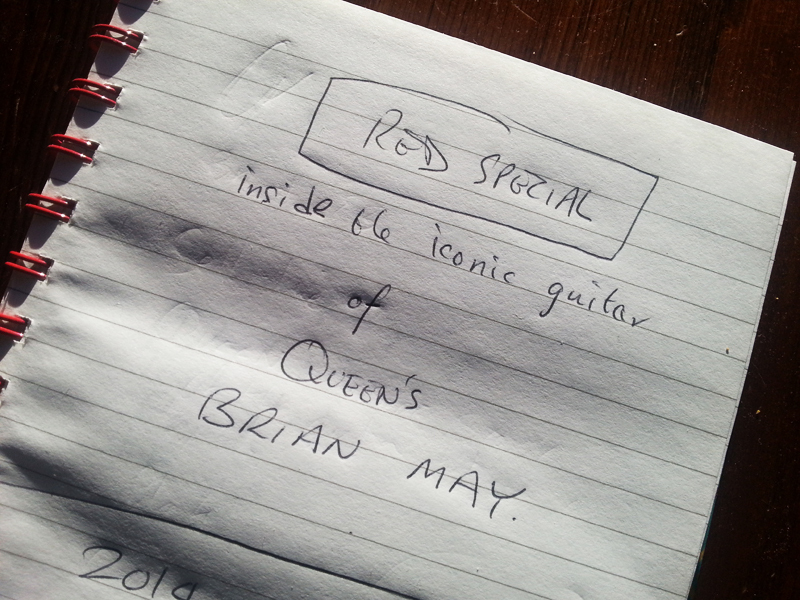 At a press conference held in Rome on 2nd September, Brian May was given the very first copy of La Red Special di Brian May, the Italian version of his book Brian May’s Red Special: The Story of the Home-Made Guitar That Rocked Queen and the World, written with co-author Simon Bradley. The book will be published in Italy by Tsunami Edizioni. 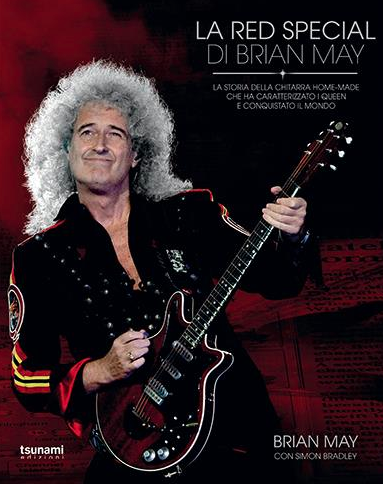 The book, which was translated from the original English by Raffaella Rolla, a long-time expert, friend of the band, and a great asset to Queen in Italy, will be available for pre-order by mid-October. 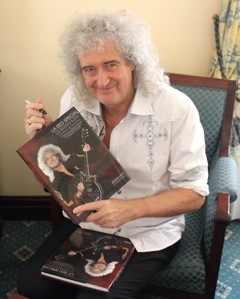 Brian kindly signed also a copy which could be won by a lucky reader. Details coming soon. 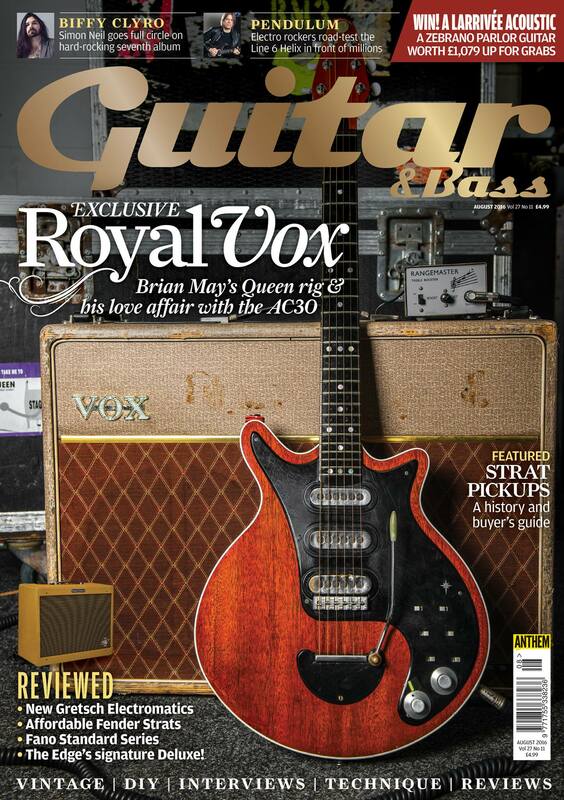 The January 2015 issue of Classic Rock magazine featured a positive review of ‘Brian May’s Red Special’, as well as new interviews with Brian May, Roger Taylor and Adam Lambert. Back issues can be purchased online.